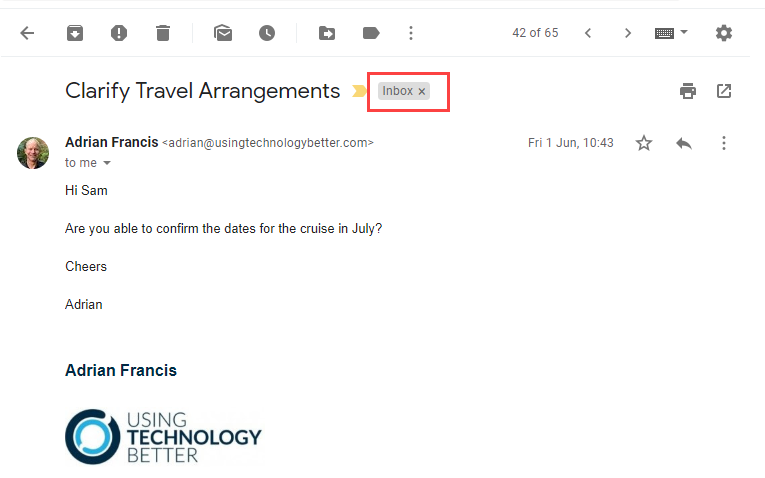 In a recent post I explained how labels work in Gmail and how they can be a very powerful and useful tool for keeping your inbox organised. In this post I’m going to dig deeper and share five advanced tips for working with labels. The longer you use Gmail, the more labels you’ll probably end up with. Over time, some of these will become less relevant and less used. For example, they may be for completed projects, old clients or related to an old position you once held in your organisation. A great way to ‘spring clean’ your label list without having to delete labels is to hide them. Hiding labels moves them to the ‘More’ section of the label list. This means that your visible label list becomes shorter, but you can still easily access hidden labels. Note: You can only hide parent labels, i.e. not sub-labels that have been nested. If you want to hide a sub-label, edit it first to remove the nesting and then hide it. 1. Hover over the label name until you see the three dots button appear. 2. 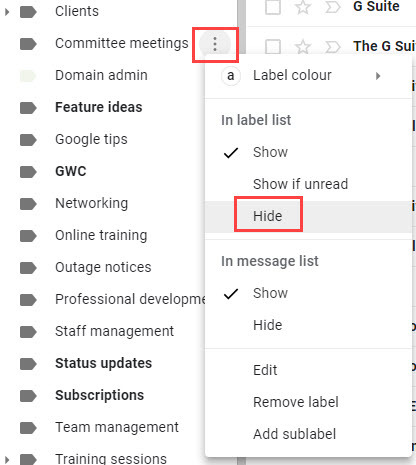 Click the three dots and then choose the Hide option in the ‘In label list’ section.Tip: If you do not see the Hide option, it is probably because you are trying to hide a sub-label. Refer to the note above about this! 3. Your hidden label will now be located in the ‘More’ section at the bottom of your label list. 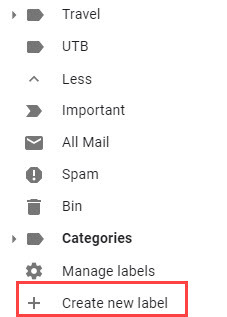 The Gmail label list is always displayed in alphabetical order. This can be a pain if your most-used label is ‘Zoology’! An easy work-around for this is to use a symbol at the start of the label name that you want at the top of your list. For example ‘@Zoology’ or ‘-Zoology’ or ‘#Zoology’. This works because symbols come first alphabetically. You can also use numbers to achieve a similar result (e.g. ‘1 Zoology’), or if you want to give your labels a customised twist, you can also use tools like Emoji Keyboard to add an emoji at the start of the label name. 1. Hover over the label name until you see the three dots button appear.2. Click the three dots and then choose the Edit option. 3. Add the symbol and click Save. This is always one of the most popular tips I share in my Gmail workshops! It never fails to get ‘ooohhs’ from the audience. In both cases you’ll notice that the email remains in the inbox. This is because dragging a dropping a label on to an email is like using the ‘Label’ button in the toolbar. 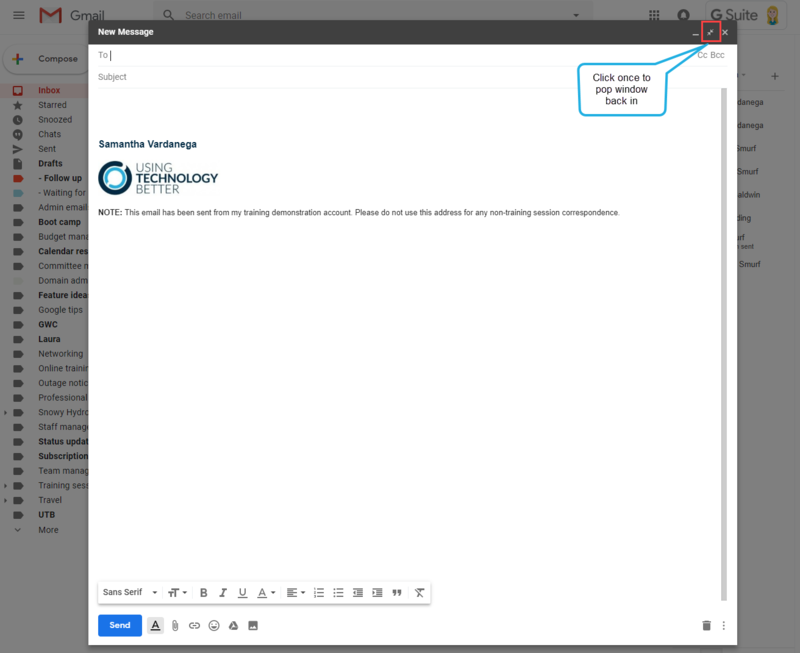 If you wanted to get the email out of the inbox, you can drag and drop the email into the label instead. 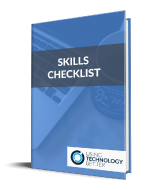 If you want to get super organised, you can even apply labels to emails before you send them. This is particularly useful if you use a ‘Waiting for’ or similar label (see tip five below). The recipient of the email will not see the label. 2. Click the three dots button in the bottom right corner of the email composure window. 3. Click Labels and tick the label(s) you want to apply. You may have noticed in tips 3 and 4 that my label list includes labels with names like ‘@Action’ and ‘@Waiting’. These are labels that I use like coloured flags to help track emails that I need to follow up, or that require action or a reply from others. 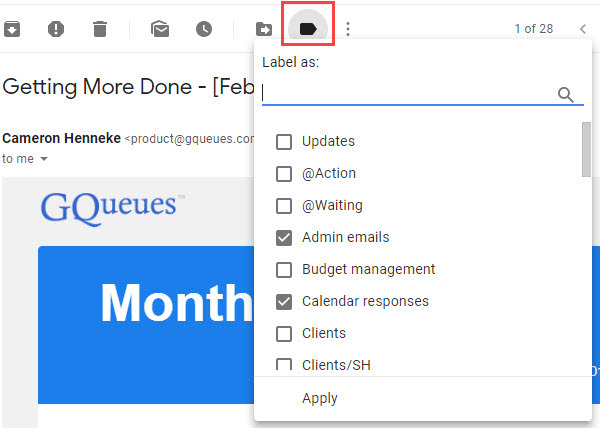 This tip warrants its own article, so head on over to my post on Using labels as coloured flags in Gmail to learn how to set it up! Are you feeling overwhelmed by emails and want to learn how to better manage your Gmail Inbox? Check out our Get efficient with Gmail the SMART way online course! How do labels work in Gmail? 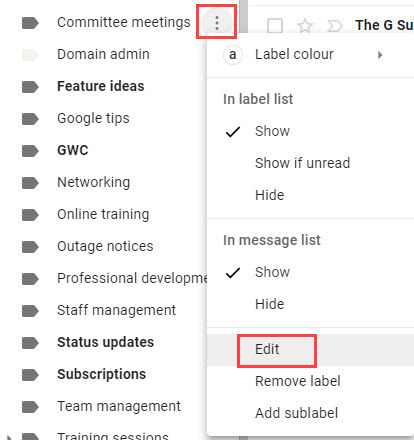 Gmail’s label feature is very powerful and useful, however it can be quite confusing for people who have spent most of their working lives using ‘folders’ in other email applications. In this blog post, I’ll explain everything you need to know about how labels work in Gmail. What’s the difference between Gmail labels and traditional folders? Similar to folders, labels are a way to organise and categorise your emails. However, there are a few key differences in the way they work. Think of a folder like a separate drawer in a filing cabinet. When you file an email into a folder, it is like storing a paper file within the drawer. Just like a file can only be stored in one drawer, an email can only be stored in one folder. The only way to have the file stored in multiple drawers is to take a photocopy of it – meaning there are two different copies. The same goes with storing emails in multiple folders – you need to make a copy of the email. Think of a label like a sticky note applied to a file. All the files are stored in the same drawer and each can have many sticky notes applied. In Gmail, emails are centrally stored in ‘All mail’ (check out my explanation of All Mail and Gmail’s Archive function in this post). 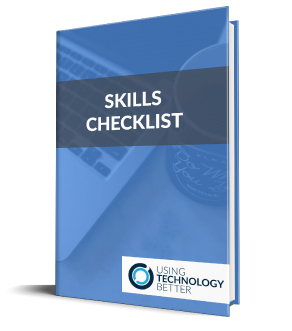 You can apply as many labels as you like to the same email – without needing to make a copy of that email. You can then view the email in all the labels you applied to it. How do I create a label in Gmail? 1. Scroll down all the way to the bottom of the label list (located on the left hand side of the Gmail window). 2. Click the More link. 3. Scroll down further you can see the Create new label link. Click this link. 4. Enter a name for your label. 5. [Optional] If you want to make it a sub-label (child) of another label, tick the Nest label under box and choose the parent label. How do I get an email out of the Gmail inbox & into a label? 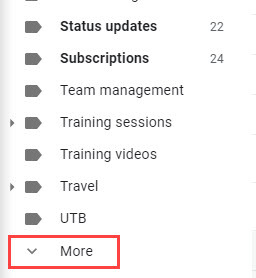 I regularly meet people in my training sessions who tell me that they dislike Gmail’s labels because ‘they don’t work like folders’. What they mean is that they have had difficulty getting an email to leave their inbox and only be shown in the label. The trick to this is using the right button! When you open or tick an email, these buttons appear at the top of the email. The Move to button will remove the email from the inbox (by removing the Inbox label from the email) and just display it in whatever label you select when you click this button. The Labels button will leave all existing labels on the email (including the Inbox label) and just add another label. If you use this button, the email will stay in your Inbox. 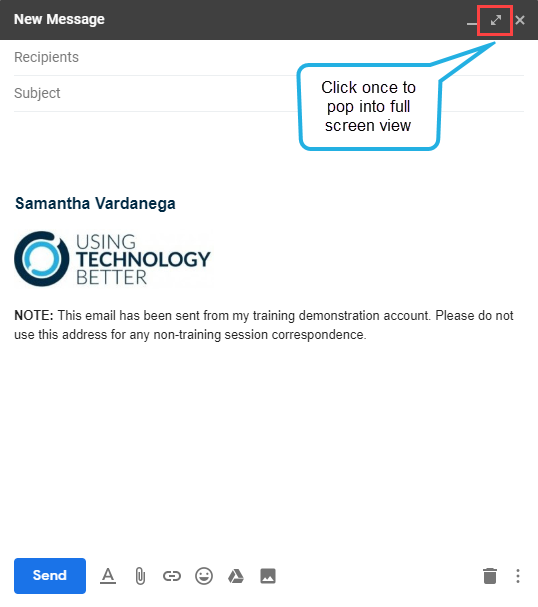 Tip: You can also drag and drop an email from the inbox into a label. This has the same outcome as using the Move to button. How do I change the name of a label in Gmail? 1. Hover your mouse over the name of the label and click the three dots button that appears. 2. Choose the Edit option. 3. Make the required changes and click Save. What happens when I delete a label in Gmail? Deleting a label in Gmail only deletes the label itself, not the emails that have the label applied. So, if I deleted a label that had 100 emails shown in it, all those 100 emails would still exist in Gmail. ‘Where would they be?’ I hear you asking! That depends… All of those emails will definitely be in ‘All mail’ (check out my explanation of All Mail and Gmail’s Archive function in this post). However, if some of those emails also had additional labels applied to them, they will still be shown in those other labels too. 2. Choose the Remove label option. Note: There is no way to recover a label that you delete, so use this function carefully. 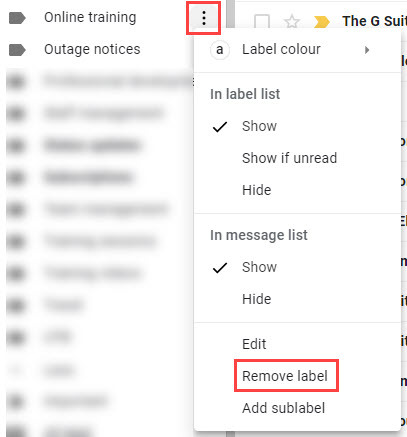 It may be better to hide the label instead, which is something I will share in my next post ‘5 advanced tips for working with Gmail labels’. How do I delete an email from a label? Because there is only ever one email in Gmail (no copies), deleting an email from one label will delete it from everywhere and send it to the bin. 1. Open or tick the email. 2. Click the Labels button. 3. Un-tick the labels you want to remove the email from. We’re all looking for ways to save time and clicks when working with email. Gmail’s Send + Archive button is a great feature that can help with this by letting you perform two actions with one click. However, many of the attendees at my training sessions either don’t know it exists or are confused about how it works. In this post, I’ll explain what the Send + Archive button does, how to turn it on and why it should be your new favourite Gmail feature! What does the ‘Send + Archive’ button do? When you click it, your reply is sent and the email you are replying to is archived. These are your two actions in one click. Now compare this to what would happen if you just clicked the ‘Send’ button. Your reply would be sent and the original email would still be in your inbox. That means you would then have to perform another action on the original email, such as archiving it or moving it to a label. But where does the email go when I archive it? I am so glad you asked! I have explained this in detail in my blog post on demystifing Gmail’s archive button, so I recommend checking that out to get a complete understanding. In brief, if the email you are replying to was only in the inbox, you will see it in the ‘All mail’ label after it is archived. However, if it was in the inbox and also had another label applied, it will be in ‘All Mail’ and the other label after it is archived. In the example below, the email would be shown in the ‘All Mail’ and ‘Training sessions’ labels after clicking ‘Send + Archive’. When is the Send + Archive button useful? There are two key scenarios in which the ‘Send + Archive’ button is most useful. Some people prefer just to archive their emails, rather than filing them away into labels. If that’s you, this feature will be a huge time saver. You can use it on all email replies and clear your inbox fast. If the email you are replying to already has a label applied (like in the example above), it’s definitely worth using the ‘Send + Archive’ button. 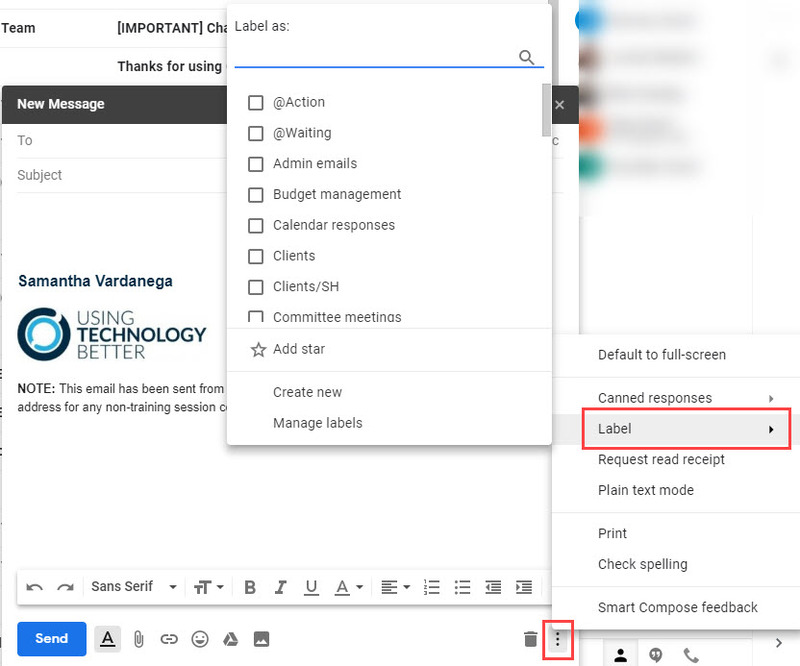 There are two reasons why the email might already have a label: (1) You have previously moved the email into a label, but it returned to your inbox because someone replied to the conversation (will only happen if you use conversation view), or (2) You are using filters to automatically label incoming emails. 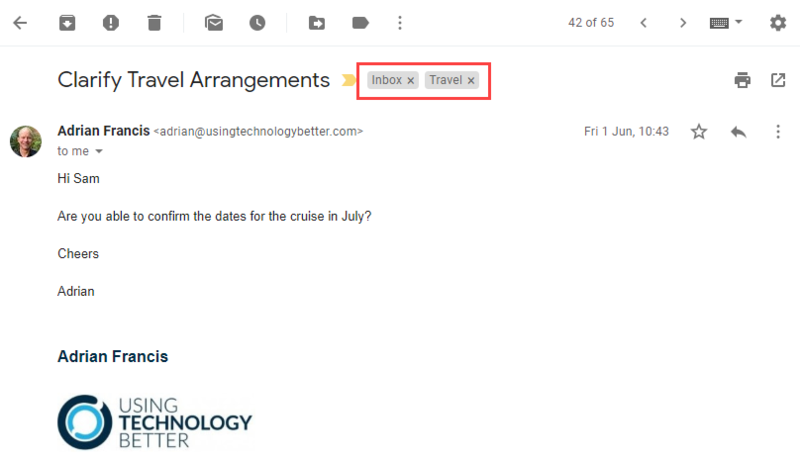 You can learn more about this latter method in my blog post on using Gmail filters to auto-label and file your emails. How do I get the Send + Archive button? 1. Click the Settings (cog) button > Settings. 2. In the General section, scroll down until you find the Send and Archive section. 3. Select the option to Show “Send & Archive” button in reply. 4. Scroll down and click Save Changes. For many people that attend our Gmail workshops, the ‘Archive’ button in Gmail is a bit of a mystery. Some people even tell me that they’re a bit scared about clicking it, as they’re not sure what will happen to their email if they do! The reality is that the Archive button does one simple thing. Read on to learn what that thing is and to demystify the Archive button for good! Where is the Archive button? When you open an email, the Archive button is in the row of buttons at the top of the message, as shown below. If you have hover actions enabled, you can also see it if you hover over a message in your inbox, as shown below. Before getting any further into the Archive button, we need to take a step back and understand the concept of labels and All Mail in Gmail. 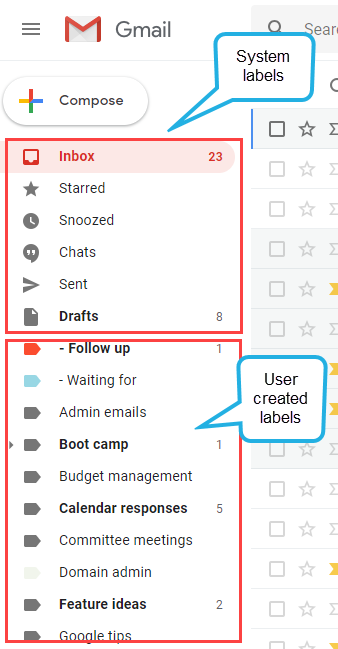 All the items shown in the left hand side of Gmail are labels. The Inbox, Starred, Snoozed, Important, Chats, Sent, Drafts, All Mail, Spam and Bin (Trash) are System labels. All the rest are labels created by the user. 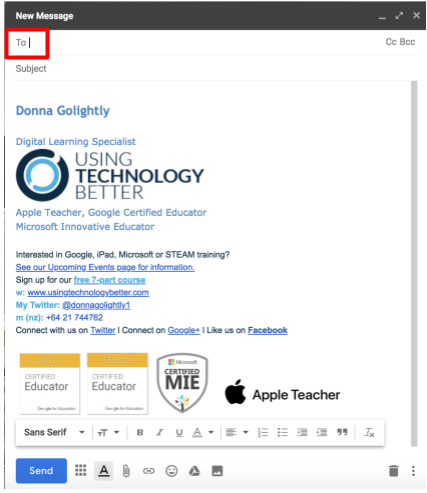 The labels that have been applied to an email are shown at the top of the message. Any emails that arrive in your inbox automatically have the ‘Inbox’ label applied, as shown below. The labels that are applied to an email determine where you can view it. So, when an email has the ‘Inbox’ label on it, that means you can view it in your inbox. 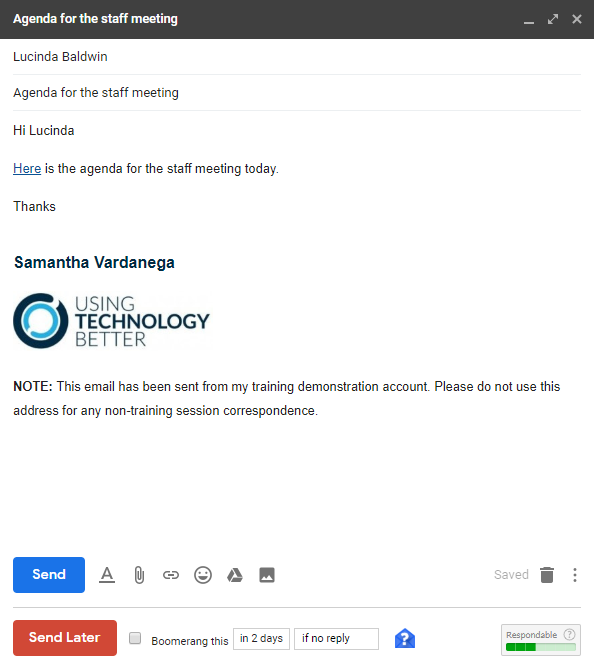 You can add multiple labels to an email. This means that it is possible for an email to be viewed in multiple places. In the example below, the email would be shown in the Inbox and the ‘Travel’ label. All Mail is also a label, but it is a bit different. It is the central store for all your emails. Every email in your Gmail account is in All Mail – except those in Spam and Bin (Trash). However, you don’t actually see an ‘All Mail’ label on the email. By default, the All Mail label is hidden under the ‘More’ menu right at the bottom of your label list. I suggest unhiding it by clicking on it and dragging it to the top of your label list (you might like to do this with Spam and Bin (Trash) too!). The Archive button removes the Inbox label from an email. That’s it! It actually does exactly the same thing as if you were to click the little ‘X’ on the right side of the label name. So, what happens to your email when you click the Archive button? This is usually the part that mystifies people the most. There are two possible scenarios here. In this scenario, the email would still be visible in all the other labels that were applied to it. 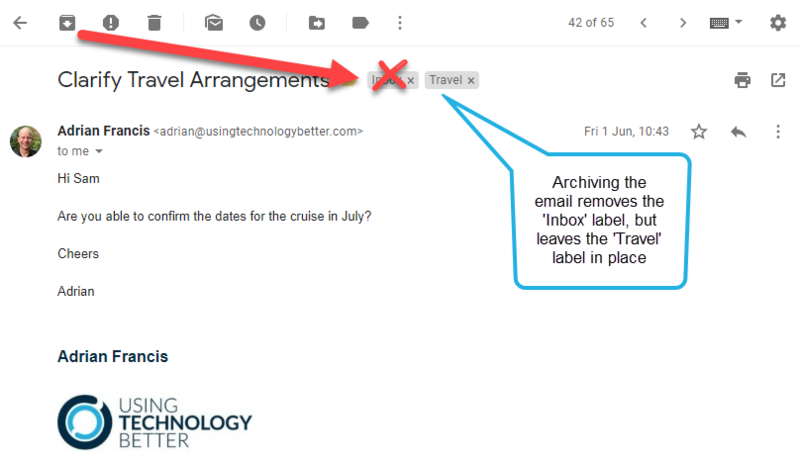 So, in the example below, the email would still be visible in the ‘Travel’ label after being archived. In this scenario, you might wonder if the email becomes ‘homeless’ after being archived! But no, this is not the case. The email will still be in All Mail. 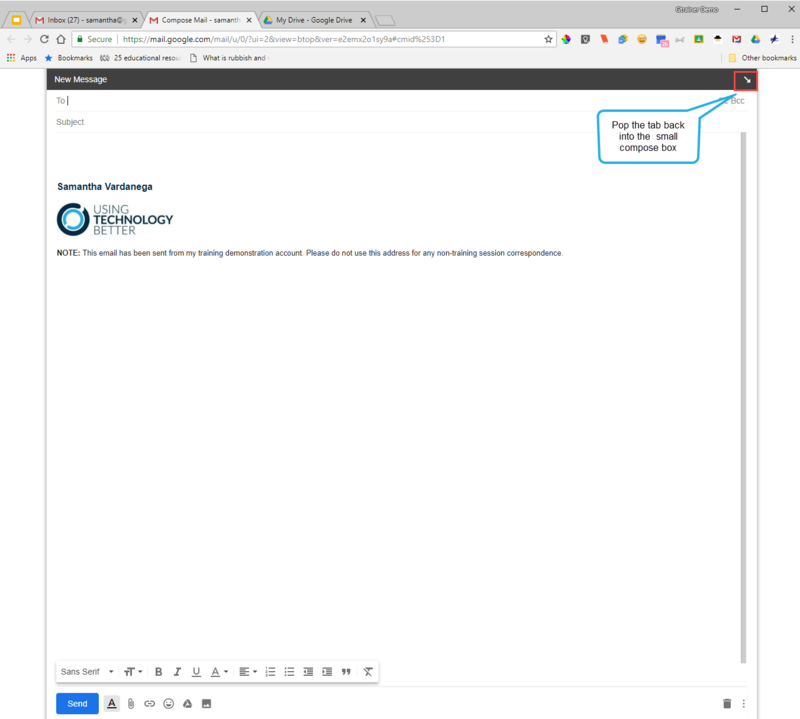 If you want to find the email again, you can search for it (if you want to learn how to improve your searching, check out this post on searching effectively in Gmail). So, why would I use the Archive button? To ‘move’ an email back into a label when it has returned to your Inbox. The email below is a perfect example of this. If it already has the ‘Travel’ label on it, I can just click the Archive button to get it out of the Inbox and just back to where I want it. To quickly and easily get emails out of your inbox without having to put them in a label. Archiving emails is the fastest way to achieve Inbox Zero. Sometimes an email doesn’t seem to ‘belong’ in a particular label. If that’s the case, just archive it instead. Or, if you struggle to maintain a label system, perhaps you’d benefit from deleting all your labels and just archiving instead! Remember, you also have the power of Gmail search to find your emails. Rest assured that deleting a label does not delete the emails within them, they’ll still be safe and sound in All Mail. There you go, the mystery of Gmail’s Archive button is now solved! I hope this helps you to use it without being scared about what will happen to your emails. 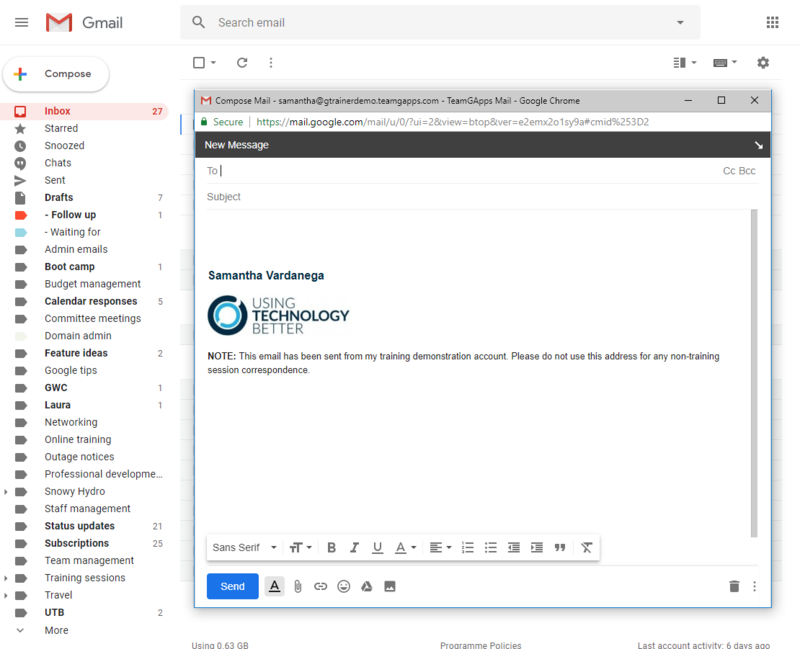 Keep an eye out for my future posts on filters and the Send and archive button and how these can help you become even more efficient in Gmail. Your G Suite account operates in the cloud, so does mean you can only use it when you’re online? Nope! G Suite has increasingly good offline functionality that enables you to access your Gmail, Google Calendar and Google Drive while offline. In this blog post, I’ll explain how to setup offline functionality for each of these applications. Access up to the last 90 days of emails and attachments (the default is 30 days, but this can be changed). Read and respond to emails. When you are next online, Gmail will automatically send emails that have been stored in your Outbox. 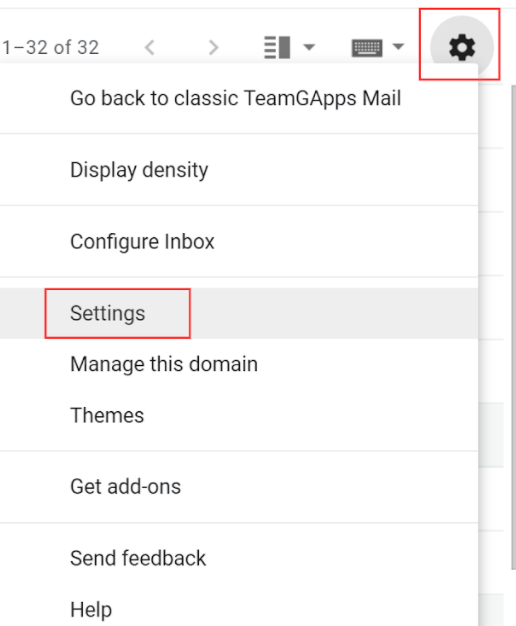 Be sure that you have switched to the new Gmail interface before following these instructions (you will find this option on the Settings (cog) button). Offline mode should only be used on your own device (not a shared device). 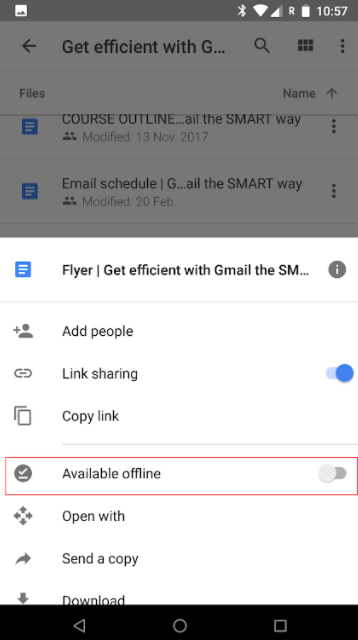 Note: Your G Suite domain administrator can choose to disable Gmail Offline for your organisation. If you do not see the settings below, speak to your IT support. 2. Click the Offline tab. 3. Tick the Enable offline option and choose your required settings. 4. Click Save changes, then Got it. To use Gmail offline, simply open Google Chrome and use a bookmark or shortcut to open Gmail. If you don’t have one, you can also visit https://mail.google.com/mail/u/0/#inbox. 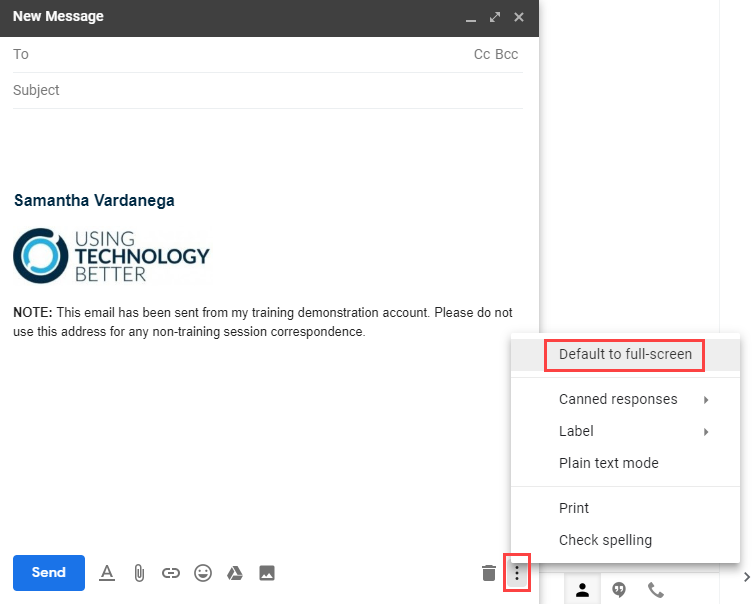 Tip: The instant spell check feature will not work in offline mode, so you might like to pay some extra attention to your spelling when composing emails! Both the iOS and Android Gmail apps have offline functionality which allows you to read, compose and file messages. However, note that not all mail will be accessible while offline. If you are planning to be offline, I recommend going in to the app and refreshing the labels you may want to use offline to ensure the mail within them has been downloaded. Offline functionality for Google Calendar is currently only available from the mobile app (for iOS and Android). Once you’ve got the app installed, you can create events, view and edit existing events and respond to event invitations all while offline. When you’re online again, these changes will be updated in your calendar and other’s calendars. The Google Drive web interface can be used offline after offline functionality has been enabled. However, this will only provide offline access to Google Docs, Sheets, Slides and Drawings (Google Forms and My Maps don’t yet work offline). If you also require offline access to non-Google files stored in Drive (such as PDFs and Microsoft Office files), you will need to use either Google Backup and Sync (for consumer Google accounts) or Drive File Stream (for G Suite accounts). 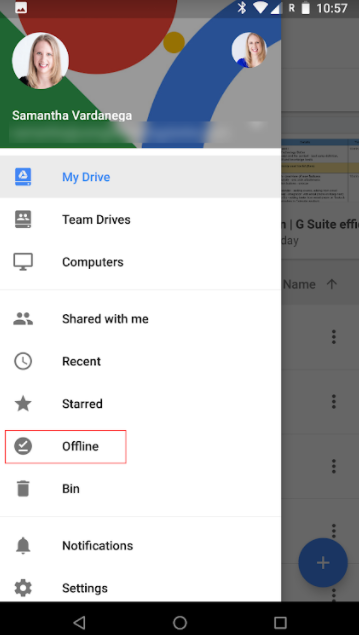 Google Drive’s offline mode provides access to view, edit and create Google Docs, Sheets, Slides and Drawings in My Drive, Team Drives and Shared with me. Any changes made are synchronised back to the cloud when you are next online. Note: If you are working on shared files offline at the same time others are working on them online, they won’t see your changes until you are back online. This could result in content conflicts which you may need to manage by working through the version history of the file. You may prefer to take a copy of the file before working on it offline. Before you can access Google files offline, you need to enable offline functionality in the Google Chrome browser by following the instructions below. Offline mode should only be used on your own device (not a shared device). 1. Open Google Drive in Google Chrome. 2. Click the Settings (cog) button > Settings. 3. Tick the option to Sync Google Docs, Sheets, Slides & Drawings files to this computer so that you can edit offline. Your files will now begin to synchronise to the Chrome browser. To use Google Drive offline, simply open Google Chrome and use a bookmark or shortcut to open Drive. If you don’t have one, you can also visit https://drive.google.com/drive/my-drive. To access non-Google files offline, you will need to install and configure either Google Backup and Sync (for consumer Google accounts) or Drive File Stream (for G Suite accounts). 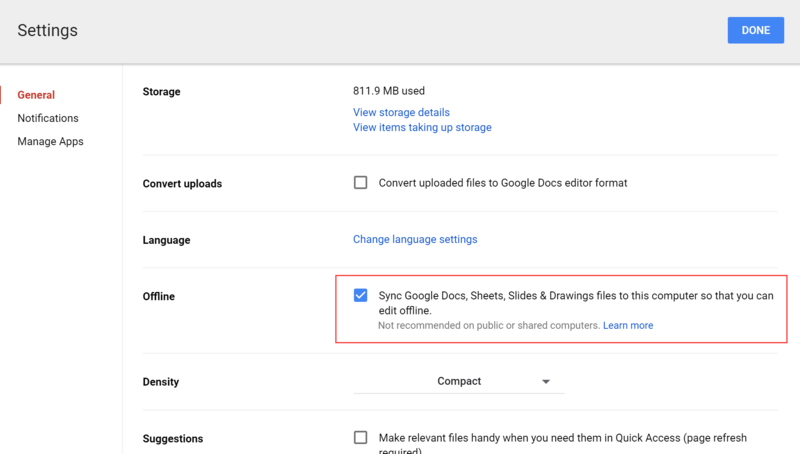 Google Backup and Sync will automatically download the files and folders you select during installation, meaning they are available offline immediately. However, it can only be used to access the contents of your My Drive. 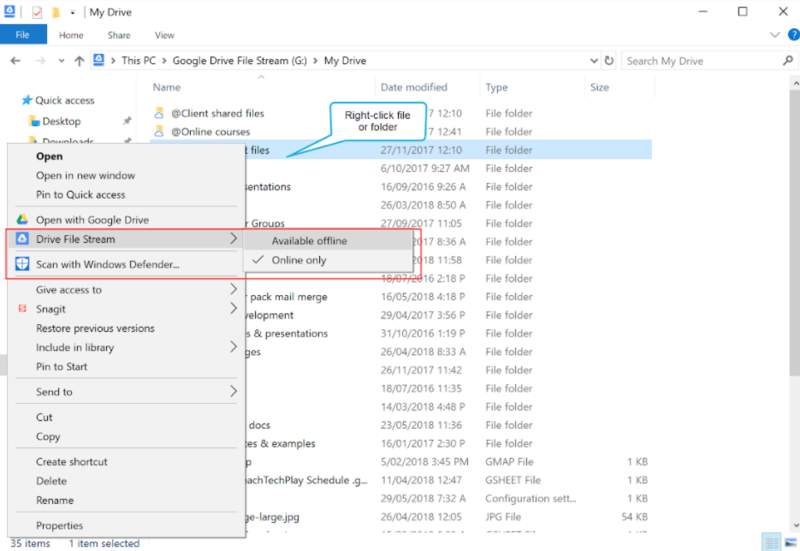 Drive File Stream can be used to access My Drive and Team Drives, however you must explicitly make these files available offline. Note: If you are working on shared files, Google will attempt to consolidate versions when your files are synchronised online. However, this can be problematic and should be treated with caution. You may prefer to make a local copy of the file before making substantial changes. The instructions below are for the installation and configuration of Drive File Stream. If you want to use Google Backup and Sync, refer to this blog post. 1. From within Google Drive, click the Settings (cog) button > Download Drive File Stream for Windows. Note: If you do not see this option, try downloading it directly. 2. Download and install Drive File Stream. 3. Follow the instructions to login to Drive File Stream. Note: If you are unable to install or configure Drive File Stream, talk to your IT Support. 4. After installation and login is complete, navigate to the Drive File Stream drive on your computer. You will find this in Windows Explorer (Windows) or Finder (Mac). 5. Locate the file or folder you want to access offline. 6. Right-click the file/folder, select Drive File Stream > Available offline. 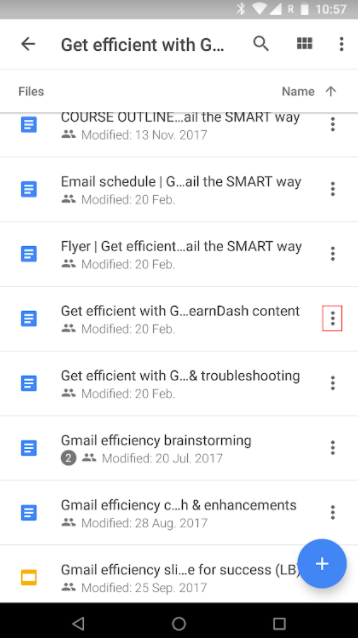 You can access Google Drive files (both Google and non-Google files) offline in the Google Drive iOS and Android apps. Follow the instructions below to enable offline access. 1. Locate the file you want to access offline and tap the three dots button on the right. Note: You cannot currently make folders available offline. 2. Toggle on the Available offline option. 3. These files will be shown in the Offline section of the Google Drive app (tap the menu button with the three lines to access). Does your organisation want to leverage the FULL power of G Suite? Contact us today to find out how our training programs can help. Some people find the Gmail compose box a little bit small and cramped. That’s why the five resize tricks I am about to share with you are so popular whenever I show them in our Gmail workshops. They’re guaranteed to get a shout of excitement from at least a couple of people in the room! So, if you’ve wished the Gmail compose box could be resized, read on to learn how to make it happen. The first method is the most frequently used as it is the most obvious. In the right-hand corner of the compose window is a double-ended arrow. Click this to open the window in full screen view. Click the same button (which now has a different looking arrow) to ‘pop’ the window back in to the smaller view. While this method certainly makes the window bigger, you will need to shrink the window down if you want to use the rest of Gmail as you’re composing a message (e.g. to locate another email). If you love the full screen view, then the good news is that you can set it as the default view. To do so, click the three dots button located at the bottom right of the Gmail window. Click the open to Default to full screen. This third method is great for people who want even more space to prepare their email, as it allows you to ‘pop’ the compose window into its own tab. The trick is to hold down the Ctrl key (or Cmd key on a Mac) in your keyboard as you click the full-screen button covered in method 1. This will open the compose window in a brand new tab. You can pop it back into the standard box by click the same button (which now has a different looking arrow) again. The fourth method is perfect for people who use multiple monitors and like to have their work spread across them. Instead of popping the compose window into a new tab, you can pop it into its own window. This makes it very easy to move around and drag between different monitors. Simple hold down the Shift key on your keyboard when clicking on the full-screen button covered in method 1. Once again, You can pop it back into the standard box by click the same button (which now has a different looking arrow) again. If you’ve decided that the new tab or window view is your favourite, then I’ve got some good and bad news. The bad news is that there is currently no way to default to this view. However, you can get there even quicker by holding down the Ctrl or Cmd (for a new tab) or Shift (for a new window) keys on your keyboard when you click the Compose button in Gmail. This will immediately open the compose window in your desired view. Creating email groups is an incredibly quick way to be able to send an email to a number of people at the same time without having to type in each email address individually. 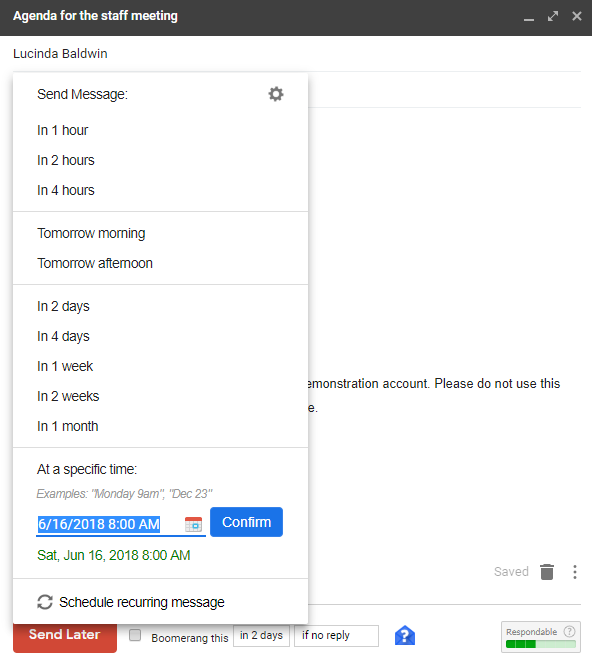 In Gmail, most people will do this from within their contacts, but did you know you can do it very quickly from within the email compose box itself? Here’s how to do it. 1. In your Gmail, open the Compose window. Tip: If you have keyboard shortcuts turned on, simply press the ‘C’ key and the Compose box opens up. 2. The magic trick here is that the word ‘To’ actually has editable options. You can create an email group right from here. 3. When you click on the word ‘To’ a new dialogue box opens up. The first step is to select where you want it to look for the addresses you want. 4. Once you have selected where you want it to look – start typing the name of the person you want to send the email to in the search box. It will start looking for it for you. Select it when it appears and you’ll see it pop up at the bottom. 5. Save your group and name it. 6. That’s it! As easy as that. Return to your original ‘Compose’ dialogue box. Type in the name of the email group you just made and send it off. 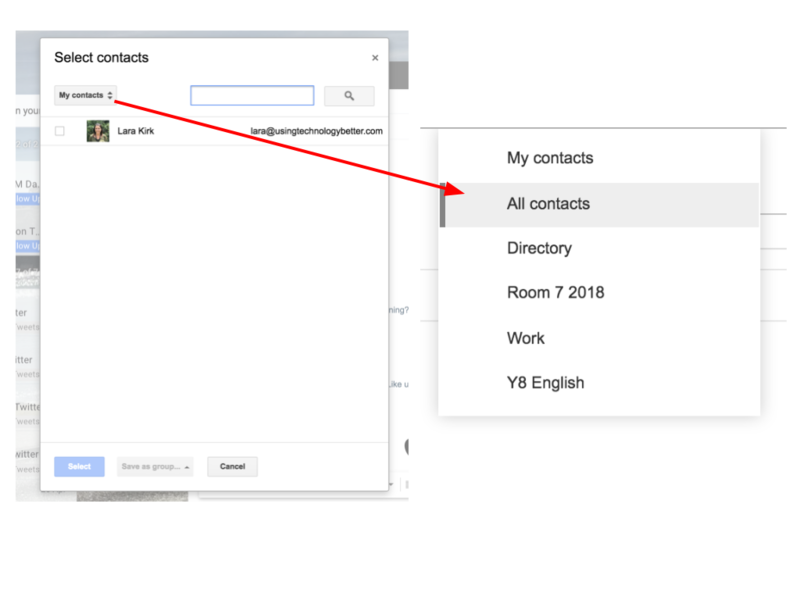 The contacts list is now saved in your Gmail contacts. 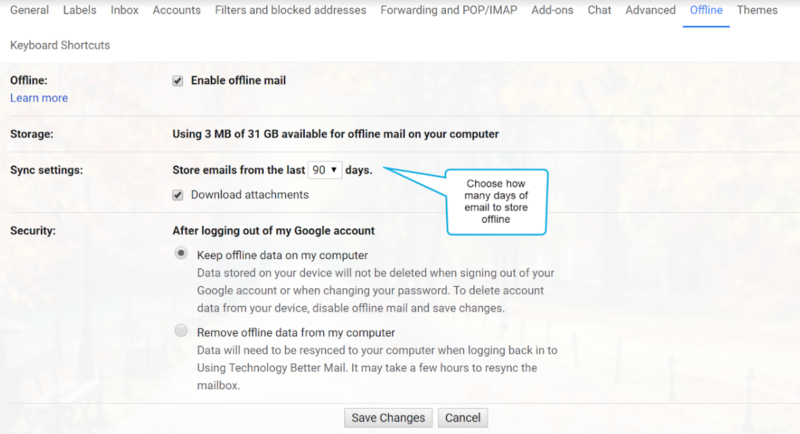 For more tips about using Gmail efficiently, check out this blog post here. One of the most frequent questions I am asked by people who are transitioning from Outlook to Gmail is “How do you schedule an email in Gmail?”. At present there isn’t a built in feature in Gmail that enables you to schedule emails. However there is a browser extension called Boomerang for Gmail that provides this functionality (and a lot of other great features!). In this blog post, I’ll show you how to install this extension and start scheduling your emails. 1. Visit https://www.boomeranggmail.com/ and click the Add this to your Gmail button. 2. Click the Add extension button (or similar) to add the extension. 3. Your Gmail will load in a new tab and a welcome tour will be shown. Click Next to work through the tour. Note: The free version of Boomerang will allow you to schedule a maximum of 10 emails per month. If you want to use it more, check out their subscription information. 2. Click the Send Later button at the bottom of the compose window. 3. Choose the time you want to send the message at. 4. The message will be scheduled. Note: The first time you use Boomerang to schedule a message, you may be prompted to give Boomerang permission to your Gmail account. This is required for the extension to function. You may need to select your scheduling settings again after granting these permissions. 5. 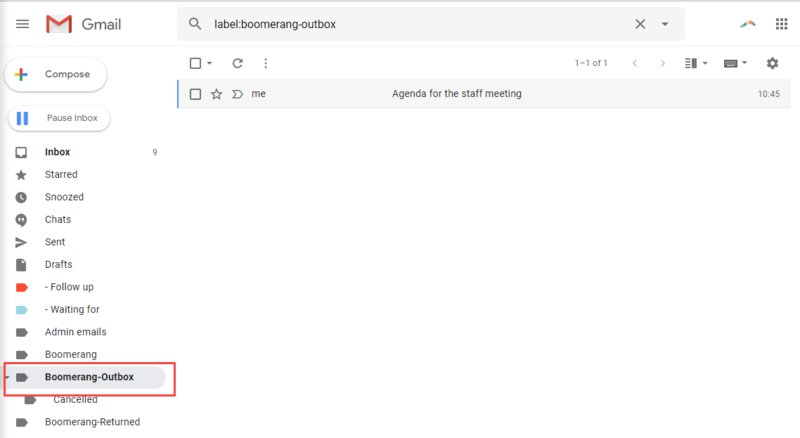 The scheduled email will be shown in the Boomerang-Outbox label until it is sent. Want to see a video of this feature? Check out this one from Boomerang for Gmail.